Last week we wrote about the questionable practices of copyright troll Mathew Higbee, based on thorough research from lawyer Paul Levy. As we noted in the post, we've heard from a few recipients of Higbee's questionable letters, and one has agreed to share his experience. This will be a two part series, with the first part, below, written by the recipient of the threat, web developer Daniel Quinn, and tomorrow, more information from the perspective of his lawyer, Carolyn Homer. Update: Here is the second post. I'm a self-taught web designer. I have a background in English literature, creative writing, and publishing. I'm a huge scifi nerd. I probably value those three things from most important to least important in reverse order. One of my favorite fandoms of all time is The X-Files. As a kid, I wanted to grow up to be as dreamy and mysterious as Fox Mulder himself. Of course I now have a lifelong affection for conspiracy theories, cerebral redheads, and aliens. I just finished writing a science fiction novel that features all three elements. I never expected that the show which brought me so much happiness in my youth would become responsible for grief and terror at age thirty-four. In 2016, Fox released The X-Files season 10 and broke my heart with its retconning of the series' central mystery. I wrote a fraught review about it on my personal blog, as I am wont to do whenever a fandom lets me down. Writing stuffy, literary critiques of pop culture on my blog, usually about science fiction movies or TV shows (e.g., “A Feminist Reading of Grindhouse” or “Mr. Robot is Cyberpunk for the Masses”), is about the only hobby I have time for outside of freelancing. In both my web design work and scifi review-writing hobby, I'm rather meticulous about my IP research. I always source photography that accompanies my articles via Creative Commons-licensed or license-free photography on Flickr. I even check the “commercial use allowed” option just to be safe. That’s thanks to interesting coursework on intellectual property I took during my Masters in Writing & Publishing from Emerson College. There I learned about the copyleft movement. Larry Lessig is someone I admire. In fact, all of my website’s original content, including my blog posts, are licensed Creative Commons because I believe in its mission. As a web developer I work frequently with open source software. My very own WordPress boilerplate—for which my livelihood depends on as a web developer—is licensed open source. This is all to say I'm not some lazy pirate who copy-pastes from Google Image Search to source photography. As a creative, I care about copyright. And as a freelance web designer, I'm managing intellectual rights all the time, whether it's by signing over the copyright to websites that I create as a work-for-hire contractor, or by selecting stock assets for my clients to buy, be that photography or software. 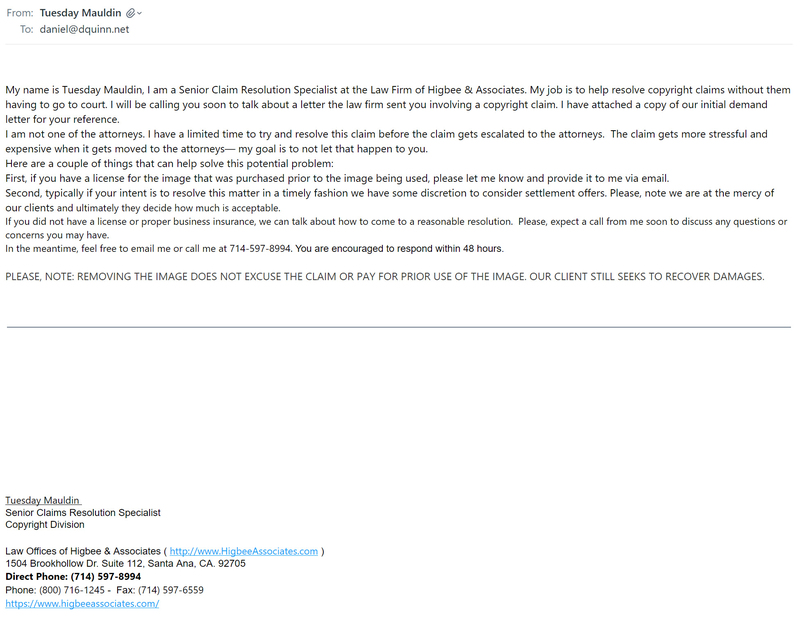 This winter I got a phone call out of the blue from one “Tuesday Maudlin” at the law firm Higbee & Associates claiming I was infringing on the copyright of a photographer Michael Grecco. I was more mortified than I was scared. How could that even be possible, given that I've been so careful to attribute everything I use? The photo in question was a thumbnail on my X-Files Season 10 review, a picture of Mulder and Scully I'd found listed as “Creative Commons” on Flickr over two years ago. Over the phone, I explained to Tuesday how I source photos, and asked her whether this image had been mistakenly uploaded or mislabeled. Tuesday said her client doesn’t provide Creative Commons licenses. While I had her on the phone, I clicked madly through the Flickr archive to see if I could still find the photo there … but of course, two years on the web is an eternity, and I couldn’t find that particular one. When I offered to take the photo down right then and there (which I did), Tuesday said her client “also wants to recover the license fee that should have been paid prior to the usage.” I asked her what his license fee might be for this image, thinking that I could pay Mr. Grecco a few hundred bucks for my (albeit accidental!) usage. After all, he seemed like a legit professional, and as a freelancer myself, I have respect for honest contract work. Tuesday said that Grecco’s license fee was $20,000. Honestly, my heart leapt into my throat. I freaked out. Winter is my slow season. It was the middle of December, the month I take off to recoup for new business in the new year. Like most working Americans, I didn't have $20k lying around. I had major end-of-year expenses coming up. I didn't have any assets, except my millennial-sized retirement fund. Would I have to dip into that in order to pay what seemed like an absolutely crazy license fee? I mean, I've bought stock from Getty in the past for clients. Getty can get pretty expensive, but honestly I’d never even seen a license for a single image that was more than $500. And that’s for 8,000+ pixel photos with global usage rights and unlimited print runs / digital impressions. I have some experience working in the publishing industry: $20k is what a midlist author would earn as an advance on an entire book, or what a photographer might earn for the exclusive rights to a photo that might appear on the cover of Rolling Stone, which has a paid circulation of like 1.5 million! My usage amounted to a single, 558-by-263 pixel-wide image that, according to my own analytics, reached a total worldwide audience of 98 visitors in the two years it’s been published on my personal blog. 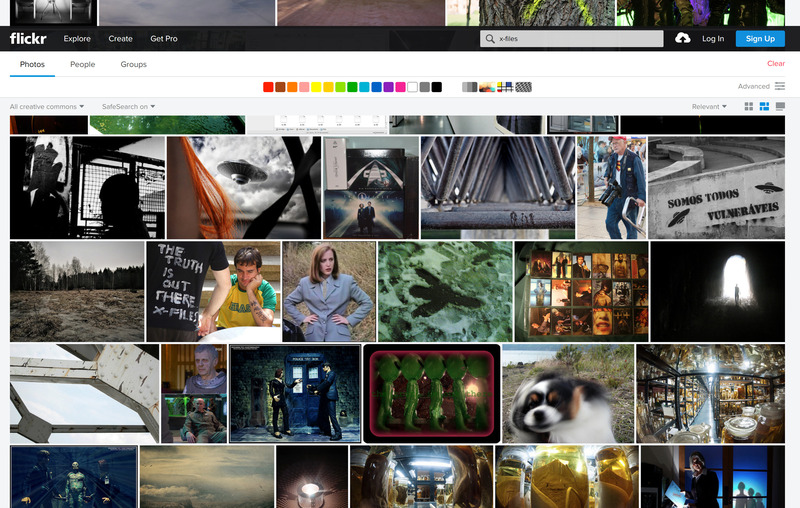 How the heck was I going to prove to Tuesday Maudlin that I innocently got the X-Files image from Flickr two years ago? And (just my luck), I couldn't find the damned thing in Flickr's ever changing archive. I also had a lingering suspicion in my head that Tuesday might not be a real person. Who has a name like Tuesday Maudlin? Her name sounds like a character from a Wes Anderson movie. Or maybe Higbee & Associates might not be a real law firm. While she was on the phone, I Googled “Higbee and Associates.” What I found was not comforting. Today, when I do the same search I get two links from the website of the supposed “National Law Firm,” and the third from a website called ExtortionLetter.info. The fourth is from /r/legaladvice with the title “Copyright Image: $1,000 payable to firm?” The fifth, from Techdirt with the excerpt “Back in June I was begrudged with a large piece of mail that I soon found out was from a National Law Firm, known as Higbee & Associates.” (I expect Paul Levy’s and Mike Masnick’s posts from last week will soon be indexed and rise up in the rankings.) Something seemed fishy. Tuesday then told me she'd emailed me several times about the claim. Now, I’m not one to overlook emails. I practice Inbox Zero every day. As a web designer, every missed email is a potential missed lead. It wasn't until I was off the phone that I found the Higbee emails: they had all been captured by my junk filter in Postbox. At a glance, I could see why my junk filter classified them as spam: the message headers were not DMARC compliant. Two of the three emails lacked SPF authentication and all of them lacked DKIM signatures. Tuesday’s email in particular was the spammiest looking, given the all-caps subject line “517865 / IMPORTANT LEGAL MATTER” and the scrunched together paragraphs of text with mismatched fonts. The original email links to an “online portal” and provides login credentials—all things which were, in my opinion as someone who’s created HTML emails for clients in the past, tell-tale signs of a phishing attack. Honestly, even if I had seen them prior to the phone call, I probably would've dismissed them as elements of an automated scam. But Tuesday also claimed she'd mailed a physical letter to me; the earliest-dated email that I recovered from my junk folder also mentioned a physical letter. Where to, I asked? After all, in the past two years, I had moved to three different apartments, so I wouldn’t have been surprised if a letter wasn’t forwarded. She gave an address: 2360 Hegal Place Apt #42 in Alexandria, VA 23242. I was too sick to laugh. Higbee & Associates must have found Fox Mulder’s fictional address from my Facebook, and mailed it there. I told her to mail me the paperwork to my actual address, and we could go from there. The copyleft movement suddenly felt like a trap. What if other images I'd acquired from the Creative Commons were misattributed like this one? I took down ALL the posts on my blog and stayed up all night, going back to see which ones I could find again on Flickr, making a log of the attributions and screenshotting the links. If I had any doubt at all, I replaced images with better-sourced ones and live links. I couldn't afford to be ruined financially for any fandom, let alone my favorite. Higbee & Associates brags about their high success rate and the money they’re generating for their clients. That scares me. If Higbee & Associates is in fact using automated technology to search for infringements and then issuing these demands en masse, most people will not have the resources at their disposal to defend themselves or pay the mind-boggling settlements. How many thousands of other people are in a position similar to mine, right now? Unable to afford an exorbitant fee, believing the threat is real, and terrified to lose their home over a single photo? One of wife’s close friends suggested I get in touch with an attorney specializing in IP law. She said the demand letter looked suspect, but she was in no position to advise because her area of expertise wasn’t in intellectual property rights. My wife reached out to a women’s networking group for referrals—which led to my meeting Carolyn Homer. Needless to say, I am so glad I did. Not only is Carolyn a nerd like me, but she lives and breathes IP. The depth of her generosity in taking on my case was matched only by her confidence and knowledge of copyright law. I started to breathe again. There were serious problems with Higbee’s demand. I could contest them, not roll over and cough up $20k. The second post, by Carolyn Homer is now available here. What I'd like to see is something on the books that lays out the fair use doctrine not as a defense in court but as an affirmative right. I've little in the way of law training, so I'm not about to try and write it out, but I would love something that can be used to slap copyright abusers across the face from frame 1.